Over the years, a frequent question to Drafto has been the origin of the name (often mispelled and mispronounced as "Drafco"). The company started in the early 1930s, making metal stampings for various industries. 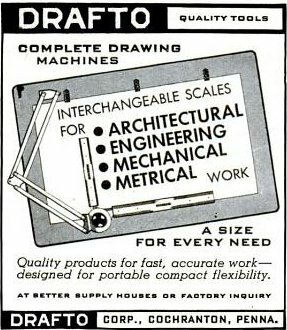 The portable drafting table (shown below in a 1947 ad) was introduced in the late 1930s ( first by the 'Drafting Equipment Co', later 'Drafto') and sold during WWII and after. In 1942, larger machining (gears, sheave wheels) began. Drafto also assembled fighter plane fuel pumps during this (wartime) period. The 1940s saw Drafto's business shift to the heavy duty material handling equipment that we manufacture today. Through the years, our commitment to "Customer Satisfaction through Excellence" has remained unchanged.